Disney's purchase of Lucasfilms a few years ago was pretty shocking to most everyone. Everyone had an idea that Disney had ideas as to what they would do with it, including what would happen to the comics. With Disney also owning Marvel, it was expected that the Star Wars comics would go to Marvel. In the meantime though, Dark Horse still has the rights and for the final days of their ownership, the publisher is offering every single Star Wars comic for $300. For the final five days of 2014, Dark Horse is offering all digital Star Wars comics at 50% off. Or pick up the Farewell MegaBundle that includes every single Star Wars comic published for the ultralow price of only $300—over 28,353 pages of Star Wars goodness! The Wookiees will be missed and bounty hunters will be sad. But take heart, young Jedi, for in these last few days, you can seal in carbonite the entire Dark Horse Digital library of Star Wars. Get every comic, every panel, and every battle in perfect digital format in your collection. Access via the Cloud City whenever you want. Many of these comics may never be in print again, and this is your chance to get over twenty years of Star Wars comics history at a once-in-a-lifetime price. This digital sale runs through 11:00 PM (PST), Wednesday, December 31. Get the Star Wars Farewell MegaBundle before it is gone like the Death Star. Please note: all Star Wars comics purchased before 1/1/2015 will remain in your digital collection. The free Dark Horse Digital comics app is now available worldwide through all modern web browsers and features cloud storage in both Google Play and iOS apps. FAREWELL, STAR WARS DIGITAL COMICS! For the final days of Star Wars, Dark Horse Digital will offer every single Star Wars comic for $300! Over 80% off digital retail value! December 26, MILWAUKIE, OR—Dark Horse Comics is sending its Star Wars comics off with a very exclusive limited offer for its digital-comics readers . . .
For the final five days of 2014, Dark Horse is offering all digital Star Wars comics at 50% off. 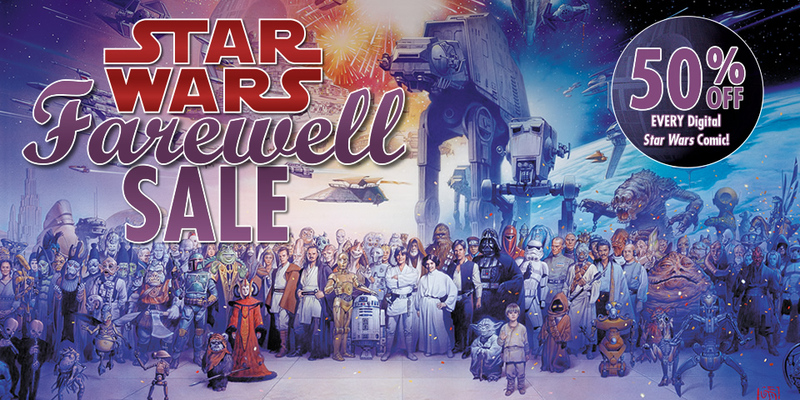 Or pick up the Farewell MegaBundle that includes every single Star Wars comic published for the ultralow price of only $300—over 28,353 pages of Star Wars goodness! As the end of an era closes, we say a fond farewell to Star Wars. The Wookiees will be missed, and bounty hunters will be sad. But take heart, young Jedi, for in these last few days, you can seal in carbonite the entire Dark Horse Digital library of Star Wars. Get every comic, every panel, and every battle in perfect digital format in your collection. Access via the Cloud City whenever you want. Many of these comics may never be in print again, and this is your chance to get over twenty years of Star Wars comics history at a once-in-a-lifetime price. This digital sale will begin at midnight (PST), Friday, December 26, and runs through 11:00 p.m. (PST), Wednesday, December 31. Get the Star Wars Farewell MegaBundle before it is gone like the Death Star. Please note: all Star Wars comics purchased before 1/1/2015 will remain in your digital collection. The free Dark Horse Digital comics app is now available worldwide through all modern web browsers and features cloud storage in both Google Play and iOS apps. Founded in 1986 by Mike Richardson, Dark Horse Comics has grown to become the third-largest comics publisher in the United States and is acclaimed internationally for the quality and diversity of its line. In 2011, the company that revolutionized the comic industry proudly presented its groundbreaking digital-publishing program, Dark Horse Digital.